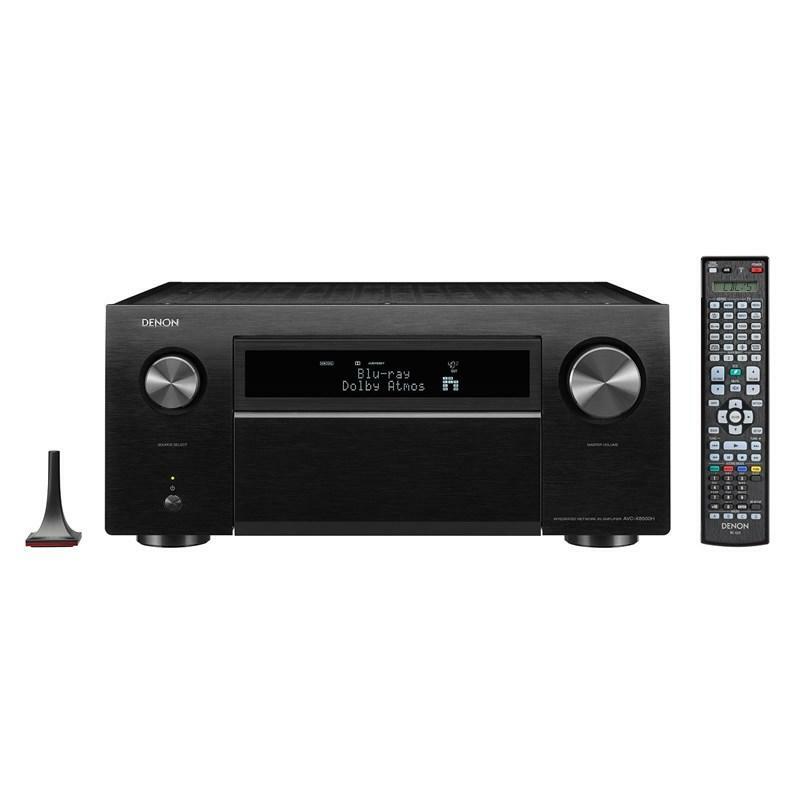 The Denon Flagship AVR-X8500H powers the next generation of home theater with the world's first 13.2 channel receiver that supports the latest immersive audio formats, including Dolby Atmos, DTS:X and Auro-3D. Built-in HEOS technology supports Amazon Alexa and takes music listening to the next level with wireless whole-home audio and voice control. 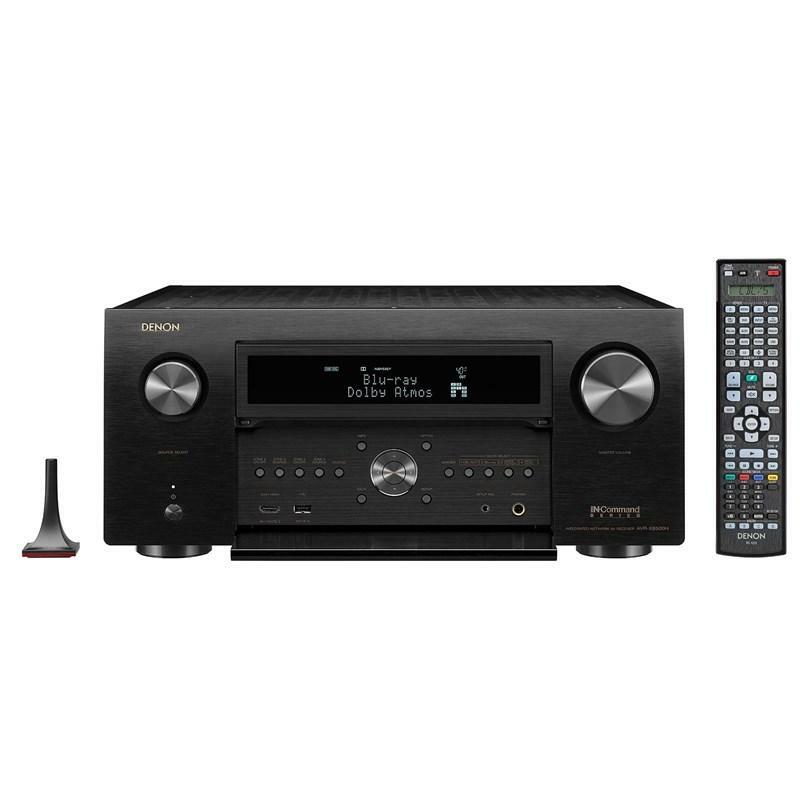 The AVR-X8500H ushers in a leading-edge home theater experience with 13.2 channels that support the latest surround sound formats and 4K Ultra HD picture. Immerse yourself in multi-dimensional sound — the Denon AVR-X8500H powers Dolby Atmos, DTS:X and Auro-3D formats. Auro-3D will be enabled via future firmware update at no additional charge. The AVR-X8500H's advanced video section is fully compatible with the latest HDMI and HDCP 2.2 specifications and prepared for any 4K Ultra HD source. High Dynamic Range (HDR), Dolby Vision compatibility, Hybrid Log Gamma (HLG) and eARC (enhanced Audio Return Channel) are supported as well. You can also enjoy ultra-high-definition pictures from legacy analog and digital sources. Every sound, all your music, controlled effortlessly. Full wireless connectivity is provided via both Wi-Fi and Bluetooth and Apple Airplay is supported. The built-in HEOS technology allows this receiver to become the app-controlled heart of a whole-house wireless multi-room sound network. 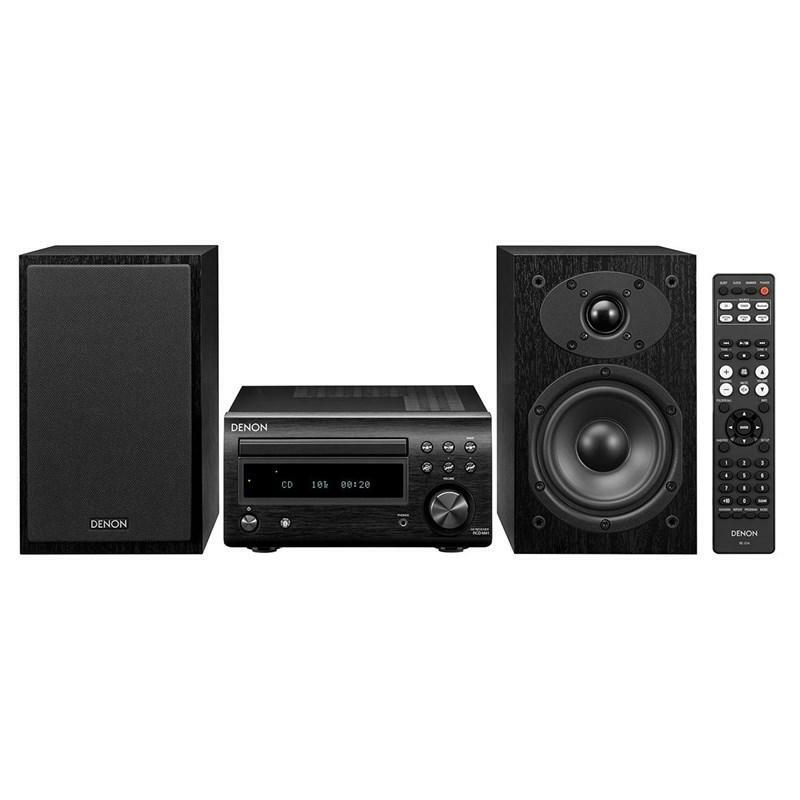 The AVR-X8500H easily guides you through the set-up process to ensure the most accurate configuration and lets you optimize all settings for the best possible sound and video quality. The most advanced Audyssey MultEQ XT32 room measurement system guarantees the best sound in every room. The AVR-X8500H boasts an advanced video processor to upscale existing lower resolution video from any analog or digital source to true 4K. With three HDMI outputs, you can even connect a TV and a projector in the main room, while playing back different content on a second zone screen. 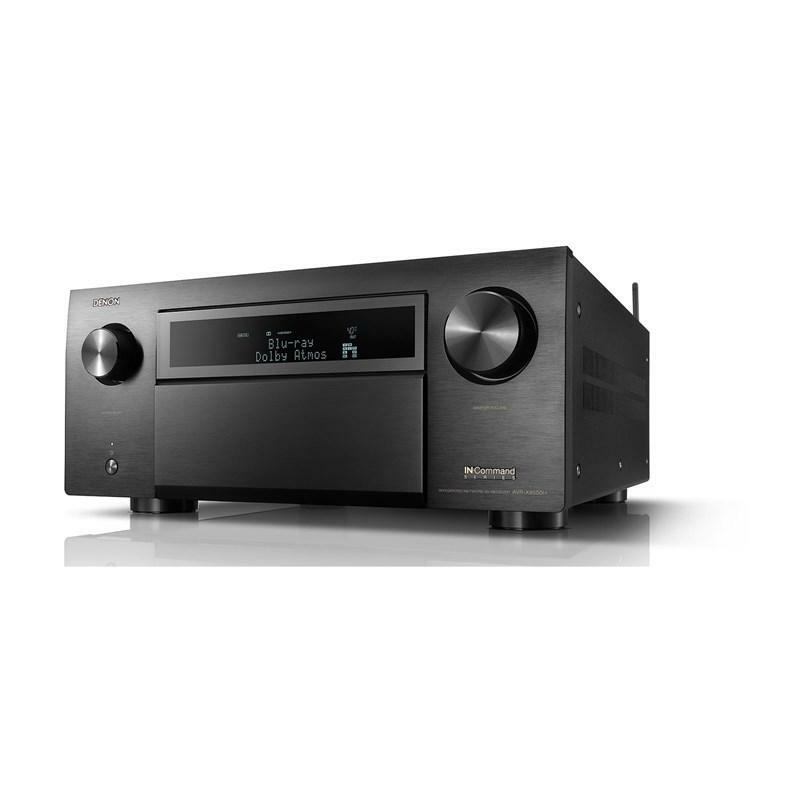 This receiver supports High Dynamic Range (HDR) video format. It is even ready for Dolby Vision and HLG (Hybrid Log Gamma). Dolby Vision transforms the viewing experiences with astonishing brightness, contrast, and color. HLG offers HDR technology over broadcast content. Control your receiver with your Smart TV remote via the HDMI CEC functionality associated with your Smart TV. Simply set "HDMI Control" to ON in your receiver, then set "Smart Menu" to ON and begin controlling your receiver with your TV remote. The Smart Menu home screen provides you quick access to source and surround mode selections, the AVR's setup menu and four Smart Selects. 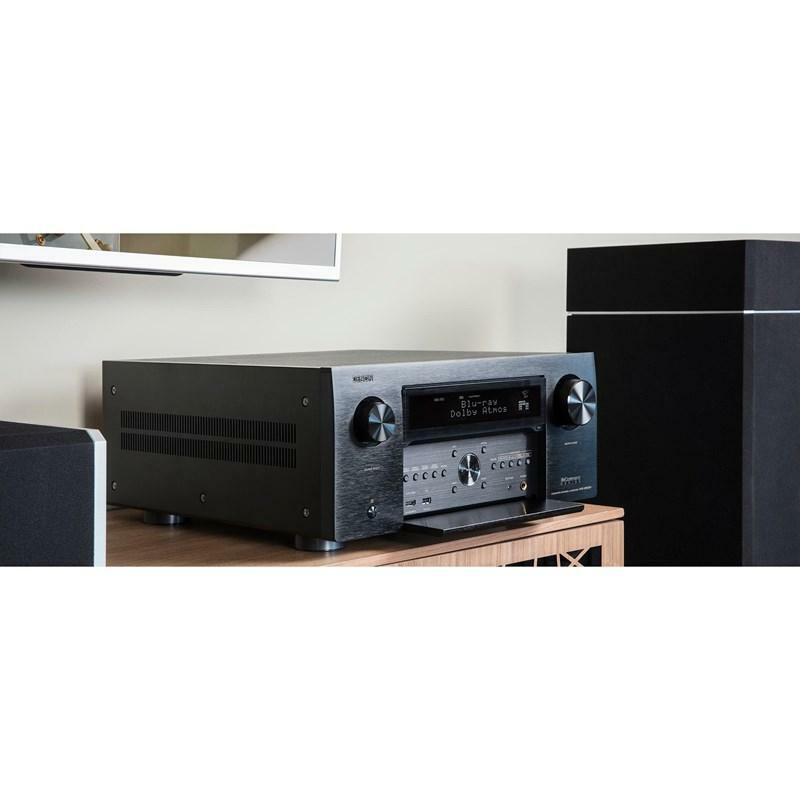 Equipped with the full Audyssey Platinum suite of advanced DSP algorithms, the AVR-X8500H features Audyssey MultEQ XT32 automatic room acoustic correction. With the supplied measurement microphone, MultEQ XT32 analyzes each speaker's output (including the subwoofers) at up to eight measurement locations and generates precision digital filters that optimize each channel for the correct frequency and time domain response. Plus, the Audyssey MultEQ Editor app lets you view and adjust settings for detailed tuning and customize the sound more precisely to your room and tastes. 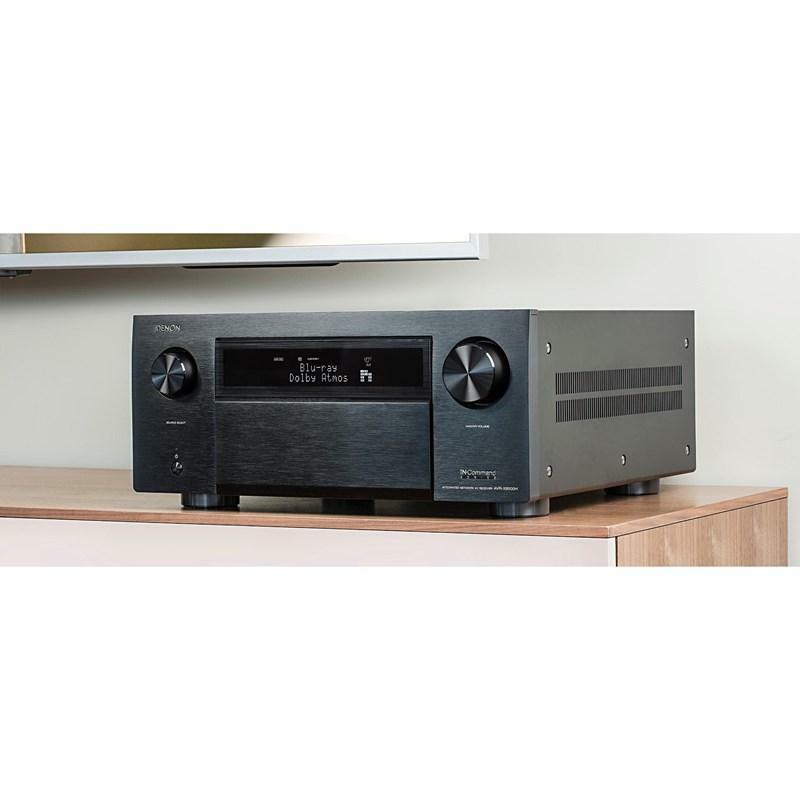 Featuring Bluetooth and Wi-Fi wireless streaming connectivity, the Denon AVR-X8500H is equipped with an advanced dual antenna transceiver system for robust streaming even in congested urban environments. Plus, with Apple's AirPlay compatibility, you can enjoy listening to your favorite audio content wirelessly from your iOS devices such as an iPhone or iPad. Easily control your music and multi-room streaming within the HEOS app, or use your voice for Amazon Alexa Voice Control. 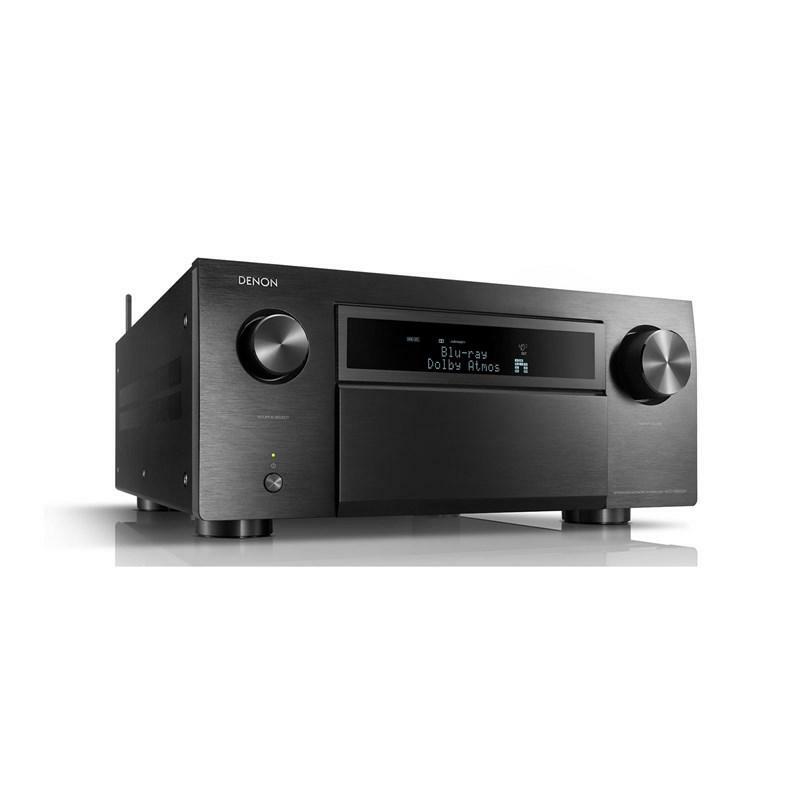 For optimum fidelity and the widest dynamic range with lowest distortion, the Denon AVR-X8500H features advanced reference-class 32-bit AKM AK4490EQ D/A converters on all channels. Enjoy consistent high-fidelity and precise channel matching across all channels for the ultimate listening experience. 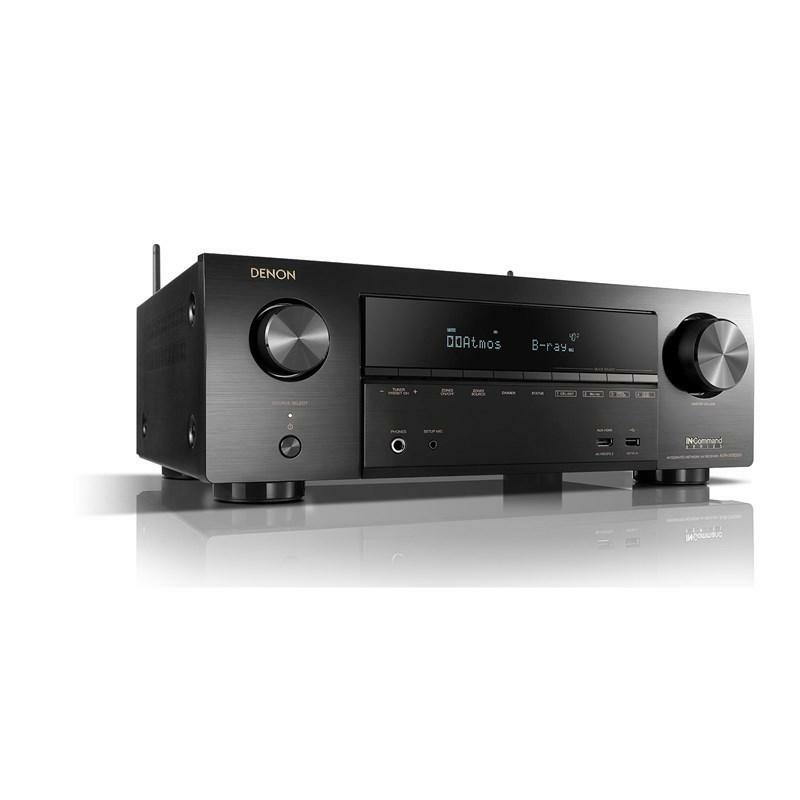 The AVR-X8500H is part of Denon's range of IN·Command series of custom integration friendly AV components, equipped with feature-rich enhanced control capabilities and compatibility with third-party and custom integration solutions. The AVR-X8500H features IP control capability for an integration with major third-party control devices and Control4 SDDP (Simple Device Detection Protocol) certification for quick and easy integration with Control4 home automation equipment. For direct connection to external home automation and control equipment, it's also equipped with an RS-232C serial port. 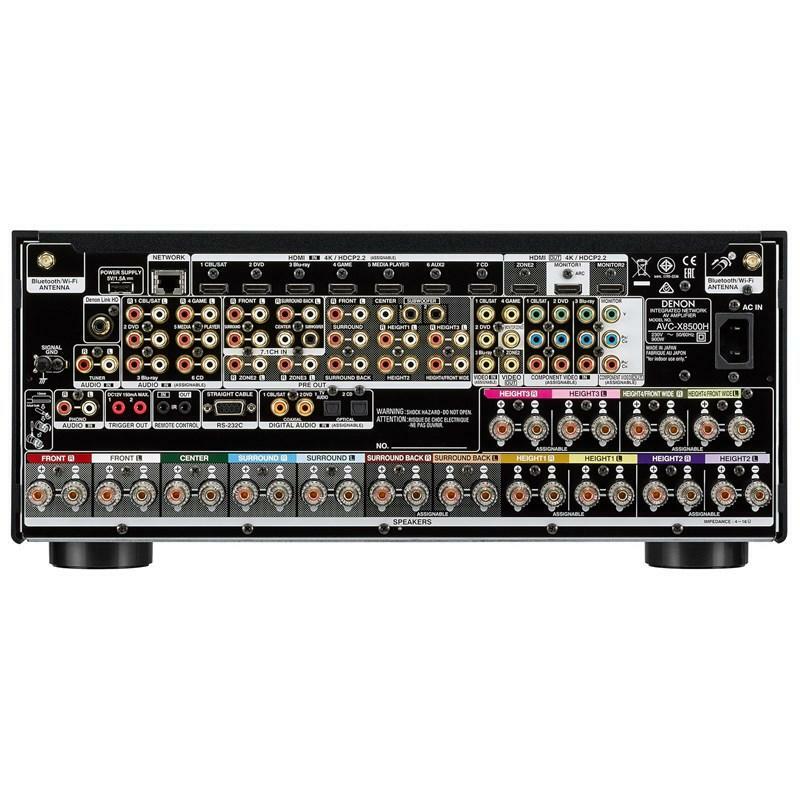 For simpler integrated control set-ups, the AVR-X8500H features an IR (infrared) remote control input on the rear panel, allowing remote control compatibility with other components in your home theater system.